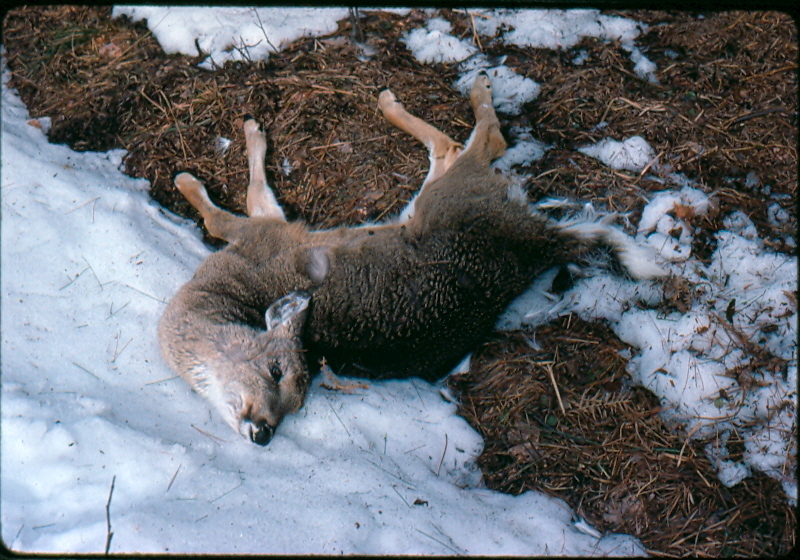 in greater Upper Peninsula deer mortality this winter. State officials, who monitor conditions there, announced in early January that that clubs, groups and individuals can now provide supplemental feed for southern U.P. deer through May 15. Supplemental feeding in the southern U.P. is only allowed with a DNR permit when conditions get harsh enough – though it is allowed every year in the northern U.P. from Jan. 15 to May 15 with a permit. Craig Albright, the DNR wildlife division field operations manager in Escanaba said this is the first winter it is being allowed in the south. The Natural Resources Commission approved doing so in 2011, but conditions have not warranted it until now. Snowfall in the southern U.P. has exceeded the 48-inch threshold set for allowing supplemental feeding. That means the region received more than 48 inches of snow since the start of winter. As of mid-January, 50 inches had fallen. “If that threshold is reached by mid-January, we know from past records it will be a bad winter for deer,” Albright said. “We lose deer outright and see an impact on fawn production. Supplemental feeding is being permitted in the following southern U.P. counties: Delta, Dickinson, Iron, Mackinac, Menominee and Schoolcraft along with areas south of the T43N-T44N boundary line in Chippewa and Marquette counties. Groups and individuals who want to provide feed can get permits at DNR offices in Baraga, Crystal Falls, Escanaba, Marquette, Shingleton, Newberry and Sault Ste. Marie. Most wildlife professionals think that supplemental feeding is not good for deer. It can facilitate the spread of disease when animals congregate over food piles. If people put food out near roads it can draw deer across highways and result in collisions. Putting the wrong food out can also be a problem. Corn can also be problem if too much is put out for deer. The DNR recommends that it be only a minor component of the feed, 25 percent or less of the total. “We caution people not to put out a high dose of corn,” Minzey said. “With deer, who have been feeding on woody browse, there is a good chance of them dying from acidosis if they get too much. Better to feed 75 percent hay or barley or oats and 25 percent or less corn. If they eat 100 percent corn it is highly likely to be problematical. Individuals or groups who want to feed for recreational viewing are allowed to do so without a permit, but must limit the volume to 2 gallons that is put out within 100 yards of a residence or livestock. This entry was posted in Uncategorized and tagged Conservation, Deer, DNR, Environment, Michigan Department of Natural Resources, Nature, Upper Peninsula of Michigan, Wildlife. Bookmark the permalink.